This loyalty is tested when an advisor switches firms, something that happens more frequently than investors may initially realize. At that point, the investor must determine with whom their loyalty lies. Some investors choose a financial advisor based on the company for which the advisor works, while other investors connect with an individual advisor first, even before knowing what company that advisor works for. As a result, loyalty can be created between the investor and the provider, or between the investor and the advisor, depending on the situation. Spectrem’s study on the subject of investor loyalty, Client Loyalty Among Affluent Investors, looks at the dichotomy of investor loyalty between the advisor they work with and the company that advisor works for. This pressure on investors is a pressure upon the advisor as well. Advisors switching firms do not want to start over with an entirely new client base that requires attracting clients, signing them to contracts, and then getting to know their investment preferences, concerns and limitations. Unfortunately, the Spectrem study indicates there is an even split among investors as to which way they would go. 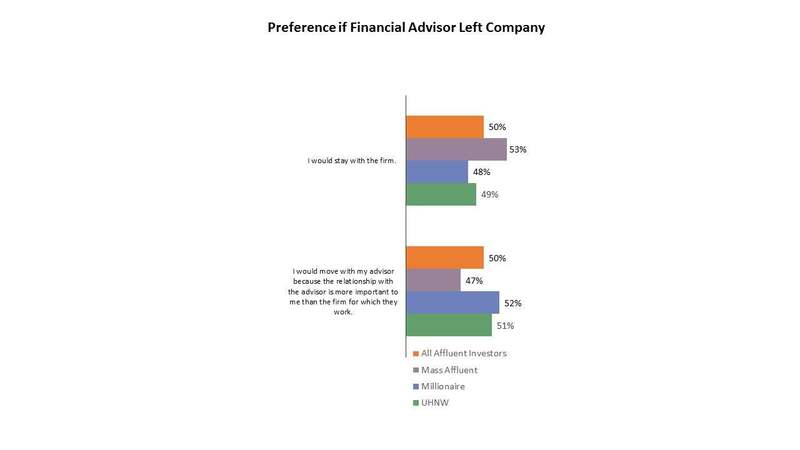 Exactly 50 percent of investors said they would stay with the firm if their advisor left, while 50 percent said they would move with the advisor because that relationship is more important to them than the firm for which they work. This even split is almost universal depending on wealth, the report notes. While Millionaires (those with a net worth between $1 million and $5 million) and Ultra High Net Worth investors (with a net worth between $5 million and $25 million) are indeed evenly split, the Mass Affluent investors (with a net worth between $100,000 and $1 million) lean slightly toward preferring to stay with the firm. It is possible that the Mass Affluent, a segment that skews younger, might not have the same amount of time invested in the relationship with the advisor, making the choice to stay with the firm more attractive and feel safer. Why do investors make the choices they do in this matter? The Spectrem study notes that two-thirds of investors who prefer to stay with the firm do so because the safety and brand name of the company is more important than the relationship with the advisor. This was particularly true right after the financial crisis, however, the loyalty has recently returned to the 50-50 level found in the most recent research. Investors were asked to judge their level of loyalty overall, to either a company or to a person within the brand or company. Overall, 42 percent of investors said their loyalty is to a person within the company, 34 percent said their loyalty is to the brand, and 25 percent said neither wins out. Segmented by advisor dependency, investors who consider themselves very advisor dependent are far more loyal to their advisor rather than to the brand (52 percent to 26 percent) while Self-Directed investors who use advisors only for significant life events are more likely to be loyal to the brand (40 percent to 30 percent). Advisors, too, find their loyalty tested. They have corporate instructions and parameters given to them when they become representatives of a firm. Occasionally, advisors can run afoul of their directives when they contrast with the desires of the investor. How an advisor responds to these pressures can determine whether a client becomes loyal to the advisor or to the firm for which the advisor works. If you are an advisor who is pleased with his current working situation, it probably does not matter to you whether the investor feels loyal to the company or to you personally, as long as they are satisfied with the services they receive. However, any advisor who might be considering a move from one firm to the next must consider the importance of client loyalty, and whether the investor is likely to follow you to a new firm. Keep in mind, the easier the administrative tasks that might be part of the change of provider, the more likely the investor will move his or her business. Investors are increasingly demanding that all of their financial information be available at one particular location. If an advisor is moving to a firm which will not provide this information, he or she is likely to lose the client. In contrast, if the available information and services are better than the original firm, it can be an attractive move. *According to Spectrem research, there are currently 29.8 million households with $100,000 - $1 million in net worth (not including primary residence, NIPR). There are 9.1 Millionaire households ($1 million - $5 million net worth, NIPR), 1.21 million Ultra High Net Worth households ($5 million - $25 million net worth, NIPR) and 145,000 households with more than $25 million in net worth, NIPR.